- Closed dollar volume of $1.225 Billion. While the Denver home market continues the seasonal slowdown, Buyers remain in the market, Sellers are motivated, the weather is changing to cooler temperatures, homes for sale remain low, lifestyle choice is the number one priority of home buyers, the new home closing rules are impacting the closing time, and the Denver economy is continuing to plow forward into 2016 even though at a forecasted decreasing rate. 2015 is going to be another record setting year. 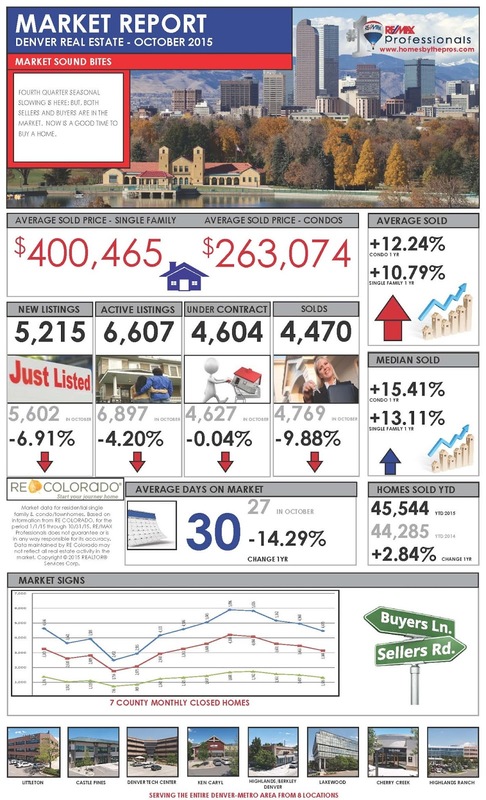 2016 will be here in a few weeks and as a Seller, what can you expect from the Denver home market? 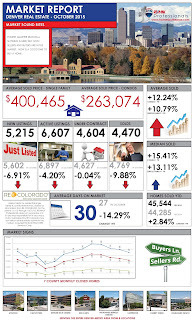 - Overall the Denver home market will continue to move forward; but at a slower pace than 2015. - Buyer demand will continue to be strong as Denver is now a destination city. - Price appreciation will not be as great as in 2015. - New household formations will continue to increase and multi generations will look to buy. - Denver will continue to be in the top 10 home markets in 2016. - Consumers will continue to focus on home ownership. - New home builders will focus on increasing the availability of their new homes. Buyers today are savvier and more educated when it comes to home markets. Sellers need to know where they want to live. Home closing time lines are now increasing by at least a week. - A conversation on how the market functions. 2016 will be here in a few weeks and as a Buyer, what can you expect from the Denver home market? - An increase in household formations. Request a Personal Home Tour! - Closed dollar volume of $1.608 Billion. Three (3) signs of a good market are: you feel it, you see it, and you hear it. The 7 County Metro Denver home market continues to be strong, buyer demand continues, new homes continue to come onto the market, and the media is constantly telling stories about the home market. Fourth quarter seasonal slowing is here; but, both Sellers and Buyers are in the market. Now is a good time to buy a home. 2015 will be another record setting year. Buyers today are savvier and more educated when it comes to home markets. We are in a slower time of year as traditionally the fall season relates to less home closing transactions per month than the prime home buying season. Sellers need to know where they want to live. Top home features that Buyers are hunting for this fall season include: bigger is not necessarily better, economic home maintenance, homes that possess a warmer cozier vibe, up to date kitchen that is sleek, modern looking, with stainless steel fixtures, energy efficient, environmentally friendly, and a home that either has a neutral color or a bright color. The new closing rules mandated by the Consumer Financial Protection Bureau (CFPB) are now in the second month. In summary, the new rules will cause a transaction to take longer from acceptance to close. Home closings are now projected to take 45 to 60 to completion. Seller preparation includes a good pricing comparison analysis, instructions on staging, what are the top improvements, introduction to a net sheet to understand the bottom line, and a conversation on how the market functions. As such, the homeowner looking to sell a home needs a professional who is a local expert, knowledgeable, and can assist in the Professional plan to sell one’s home. November is considered to be yet another great month for Buyers. This is because the prime home buying season has passed, the supply of homes available for sale is slowly increasing, home prices are not increasing as fast as they did in the prime home buying season, and there is less Buyer competition today than during the prime season. As such, a Buyer must still be prepared and still willing to move quickly. Be prepared and knowledgeable of the new loan rules, their impact on closing dates, and the potential increase in interest rates. - Closed dollar volume of $2.12 Billion. June traditionally is the month for vacations and with that said, the market set new records in June but also saw a slight easing of the number one home market in the country! A little over thirty days remain until the start of school which is a Buyer expectation to have a new home by the start of school. The Denver home market will continue to be a number one focus because of the limited inventory of homes for sale, new home construction opportunities and challenges, and rising rent prices. Denver is now a destination location and more consumers are moving to Denver. The Denver home market continues to set records, is considered a top home market in the United States as well as a destination city, and is constantly changing. In preparing to put your home on the market, consider these home improvements. Top exterior home improvements are to replace the front door, update the landscape, paint the exterior, add home automation, add a privacy fence, and update the windows. Top interior home improvements include repaint the interior, upgrade the lighting, update the kitchen counter tops, and change the bathroom tile. These improvements will add fireworks to your home and leave a lasting impression on the Buyers. Seller preparation includes a good pricing comparison analysis, instructions on staging, what are the top improvements and a conversation on how the market functions. As such, the homeowner looking to sell one’s home needs a professional who is a local expert and can assist in the Professional plan to sell one’s home. With the ever changing Denver home market, Buyers need to be prepared. More homes are available for sale, mortgage interest rates are changing, escalation clauses in offers are no longer in vogue, highest and best offer is the new offer methodology. As a Buyer, you do not want to win just for the sake of winning. You want to win when it is the best for you the Buyer. Remember the goal is to get to the finish line and purchase a home that is right for you. Today’s higher prices have been expected as the economy improves and the first time and boomerang home buyers return to the market. Even though demand outpaces supply, there is no indication that a housing bubble is on the horizon even though the Denver home market is now considered number one in the national home market. Yes, new listings have increased dramatically in April; but, the overall shortage of active listings and the abundance of buyers equal the ingredients for hot, Hot, HOT market in the mid to lower price ranges. The spring home market is underway with more homes coming unto the market; but, yet buyer demand exceeds the availability of homes on the market. What is the one thing a Seller can do? Create a lasting memory for house hunters otherwise known as Buyers. Is it curb appeal? Is it remodeling of the bathroom or kitchen? Is it new windows and doors? Is it de-cluttering and staging? Whatever it is, find that one thing about your home that will leave a lasting memory when your home is shown to a prospective buyer. Remember that 30% of Americans are looking to buy either in 2015 or next year in 2016. As such, Buyer demand will remain strong for the remainder of the year and into next year. With low inventory, increasing household formations, and pent up buyer demand; Sellers should expect many showings, multiple offers, even offers without the prospective Buyer ever seeing the home and creative Buyer outreach either by video, letter, or person to person. If your home is on the market or will be soon, how do you satisfy a buyer’s need resulting in the successful sale of your home? Let’s not forget that buyers have done their homework, know exactly what they want in their new home, and will only compete for the homes of their dreams. As such, the homeowner looking to sell one’s home needs a professional who is a local expert, knowledgeable, and can assist to sell one’s home. Over 6,700 new listings came onto the market this month and yet buyer demand continues to increase as we are moving through the spring home market because of improvement in the overall economy, increase in population, rising rental rates, desire to move, and affordable mortgage interest rates. Creativity is the name of the game with Buyers as Cash financing is happening more and more, Responsive is number one, Eager is number two, Active is on, Time is of the essence, Involved, Venturesome, Idealic, Thorough, and Yes are the guidelines that Buyers use when looking to buy a home. Buyers are experiencing frustration as it takes several offers on several homes to acquire a home. - Closed dollar volume of $1.46 Billion. - The March month ended with record setting transactions when looking back five (5) years. - Consumer confidence increased in March to 101.3 up from 98.8 in February. - Early forecasts indicated that the Denver Home Market would be in the top ten; now it looks like the Denver Home Market will be in the top five (5) in the nation. - Market “frenzy” in the lower price ranges has returned as we are seeing more homes coming onto the market, new listings receiving many showings daily, new listings receiving many offers, and the new listings going under contract in a manner of days. While the current inventory of homes available for sale remains low, more homes will be coming onto the market. Buyers will include First Time Home Buyers, Generational Buyers (both young and older), Boomerang Buyers, and Investors. With low inventory, increasing household formations, and pent up buyer demand; Sellers should expect many showings, multiple offers, even offers without the prospective Buyer even seeing the home and creative Buyer outreach either by video, letter, or person to person. Quick thoughts on how a Seller can leave a lasting impression with a Buyer on his/her home for sale: inspired staging, bold paint jobs, de-clutter each room, make each room feel less personal, new front door, make the home feel fresh and clean, and creative landscaping. If your home is on the market or will be soon, how do you satisfy a buyer’s need resulting in the successful sale of your home? Let’s not forget that buyers have done their homework, know exactly what they want in their new home, and will only compete for the homes of their dreams. As such, the homeowner looking to sell one’s home needs a professional who is a local expert, market knowledgeable, and can assist in the Professional plan to sell one’s home. Now is the time to reach out to a seasoned Professional. Market frenzy is here again. More new listings will be coming onto the market and Buyers will be competing for the home of their dreams with creative offers and creative outreach to the Sellers. While lifestyle choice remains number one, economic reality is quickly moving up to replace lifestyle choice in the home buying process because of the double digit increase in rent prices in the Denver area, pent up Buyer demand, and the low inventory of homes for sale. What is a Buyer to do? Manage your expectations, be prepared to participate now as time is of the essence, and remain positive about the home buying process.